The album cover has been described as having a stick figure with X's for eyes. 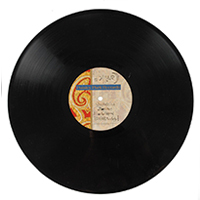 However, rather than a fully developed design this is believed to have been only in the stage of Prince drawing on the white unmarked sleeve of a test-pressing, much like the 12" to Gett Off. The labels of the vinyl would have been the first with the new Paisley Park design and featured the song titles in Prince's own writing, as well as the name Camille with the C as a crescent moon. And an x instead of the dot on the i. The name Prince would not have been on the record. This page was last modified on 8 April 2019, at 14:12.